Last year, I told you about Frances Semler. At age 74, she is a member of the Minutemen, who perform a valuable service in monitoring our porous borders. Semler was appointed by Kansas City Mayor Mark Funkhouser to serve on the Kansas City Parks and Recreation Board. It was very controversial due to liberal outrage, but the courageous Mayor Funkhouser stuck to his guns. 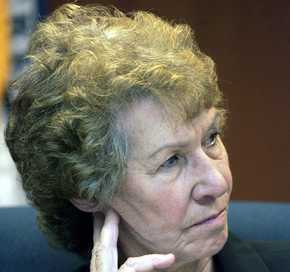 Sadly, Ms. Semler resigned from the parks board because she felt her involvement had become too contentious. Why? Well, the National Council of La Raza and the Southern Christian Leadership Conference canceled plans to hold their national conventions in Kansas City because of Ms. Semler’s presence on the parks board, solely because she is a member of the Minutemen. Also apparently, in recent days, Semler has taken issue with comments made in published reports by Mayor Mark Funkhouser and his wife, Gloria Squitiro. “I do believe I have been a positive asset. There are many projects I eagerly wanted to pursue,” Semler writes. But after reading quotes from Funkhouser in the The Star last week, “I feel BETRAYED.” . . . The appointment triggered sharp protests from several minority organizations, including the National Council of La Raza, In October, of La Raza voted to pull its convention from Kansas City, at a projected loss of $5 million, because of Semler’s connection to the Minutemen, a divisive group that takes a hardline stance on immigration issues. On Jan. 15, the leader if the Southern Christian Leadership Conference said that the SCLC had decided to move it’s convention from Kansas City to New Orleans and would call for a boycott of Kansas City if Semler was not removed from the park board. Rita Valenciano, head of the local Coalition of Hispanic Organizations, said Semler’s decision to step down was a welcome outcome. But she, added, she would have preferred if the mayor had taken action himself. Semler had offered to resign last year when controversy first erupted over her appointment, but Funkhouser declined the notion and publicly backed her appointment. . . . While referring to illegal immigration as a “well-organized invasion of illegals,” she defends the Minutemen as an unjustly attacked group dedicated to the enforcement of immigration laws. The disgusting level of attacks on this brave 74-year-old woman, who merely cares about safe and secure borders, is disturbing. But Frances Semler has the class and dignity her intolerant, liberal detractors do not. This is yet another casualty of liberal “tolerance” of “diversity.” Kudos to her for sticking around and putting up with vicious attacks for this long. The New McCarthyism has taken hold. Take back our country. Amazing that “open border” advocates exist. No one, not even someone who is currently here illegaly, benefits from “open borders”. La Raza? La Raza es STUPIDO!!!! What is funny is that Mexicans are laughing while Democrats tear into Republicans and Republicans shred the Democrats. What better conditions to run over Amwrica? Maybe this will work out to benefit Kansas City in the long run. If la raza and the sclc don’t want to go there, we do.